The Gray Treefrog is actually two different species, Hyla versicolor and H. chrysoscelis, that are identical in outward appearance in every respect. The information in this article applies to both species. Unfortunately for the hobbyist and the field herpetologist, there is no visual method to differentiate tadpoles or frogs of these two cryptic species with certainty. Sadly there is an abundance of misinformation on differentiating the two, particularly on the internet, but short of laboratory studies by a biologist, the only methods of definitively distinguishing the two species are by voice and geographical range. Temperature: Probably varies with geographical origin. Southern specimens withstand highs in the late 30s °C (95+ °F). Vivarium: summer ~ 20-30 °C (68-86 °F), winter ~0-10 °C (32-50 °F). Survives periods of freezing solid (to -6 °C/21 °F). A very hardy species. Hyla chrysoscelis, Cope's Gray Treefrog, from Nebraska, the only species there. The two species overlap throughout much of their geographical range but there are areas where they do not coincide. Their voices differ enough that an experienced ear can usually differentiate the two, especially if they are calling in the same locale - H. versicolor has a lower pitch call, with a lower rate of pulses when compared to H. chrysoscelis. Telling them apart using the call is complicated by the fact that both species' calls are dependent on temperature - the higher the temperature, the higher the pitch and pulse rate. The call of H. versicolor can been described as a "bird-like trill", while the call of H. chrysoscelis is more like a buzz. Hyla versicolor is actually a recently evolved offshoot of H. chrysoscelis - genetically they are very similar, but unusually for any animal species, H. versicolor has 4 copies (tetraploid) of DNA in each cell. H. chrysoscelis has the normal 2 copies (diploid), like humans and most complex organisms. In terms of diet, breeding behaviour, habitat preference, biology, etc, the two frogs are effectively identical. Ralin (1968) found that the diets of the two species differ slightly, and that H. chrysoscelis forages at higher levels in the forest than H. versicolor. At the present time, both species are considered common in the wild and face no unusual threats. They end up for sale in the North American pet/reptile trade occasionally, but, due to their abundance in the wild there, most US herpeculturists collect their own and, sadly, very few actually try to breed them. Gray Treefrogs are less frequently offered for sale in the European pet trade and these too are usually wild-caught. However, you are more likely to encounter captive bred gray treefrogs in Europe than North America. An old common name for the gray treefrog was the "tree toad" because it has relatively warty skin for a frog. The scientific species name "versicolor" describes the ability of these frogs to vary their colour enormously. In fact, many people view these two frogs as the chameleons of the frog world. Depending on the background and stress level, the frogs can vary from near black to almost white, and they can also turn their back/dorsum bright green - have a look at the photos on this page. The green colouration can combine with the frog's dark banding to give the impression of lichen-covered tree bark. This frog is incredibly difficult to spot in a tree when it isn't calling, and consequently, few females are ever observed because they are silent. There is almost always a white patch below the eye, sometimes outlined in black, and this is present in both species, despite what some books/people will tell you. The white patch varies in size and shape between individual frogs and it can be a useful method for distinguishing individuals. The underside is usually white to cream in colour and males have darker throats, particularly during the breeding season. The inner surfaces of the thighs of males vary between bright yellow and bright orange - in females this colouration is quite reduced or washed out. As with most Hylid species, gray treefrogs have well developed toe-pads, and these adhere to almost any surface, from tree bark to human skin! Breeding spans a 2-3 month period from spring to summer, depending on latitude: in Texas breeding begins in early March and is over by the end of May, just as the American Green Treefrog (Hyla cinerea) begins its breeding season; in more northerly states, such as Missouri and Illinois, breeding begins in April or May and runs into July. During the breeding season, males are found in trees and shrubs in or near pools of water. Females only visit the breeding pond to lay, and since they do not call they are hard to observe in the wild. Females are larger and stockier than males. 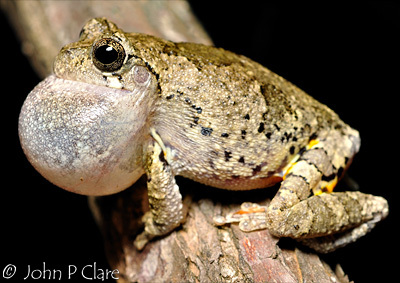 Gray treefrogs show a strong preference for temporary water bodies in which to lay their eggs, and these can include small forest ponds, roadside ditches, and swamps. They have even been known to lay in backyard swimming pools, presumably due to the absence of fish. 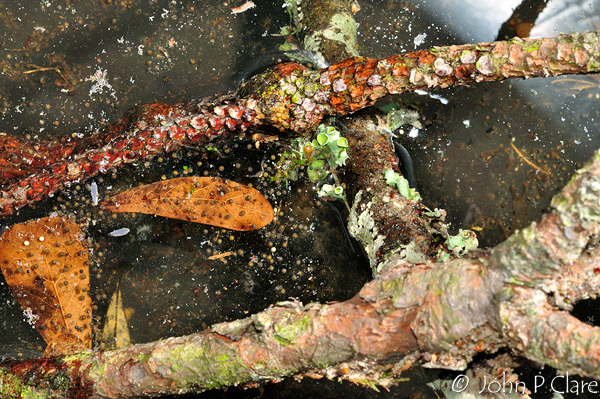 Eggs are laid on the surface of the water and are usually attached to vegetation. Up to two thousand eggs can be laid in packets of 10 to 40 and the first author has observed an even greater number from one female. Eggs can hatch in less than 4 days but this is temperature dependent. Tadpoles can reach metamorphosis in less than 30 days under ideal conditions (personal observation of first author), but it can take as long as 60 days, depending on the climate. Three adult Eastern Gray Treefrogs, Hyla versicolor. The one on the left, a female, was sitting on a different background to the two males prior to the photo - put them on the same background and they will all change to the same colour, and they can turn their pattern on and off too! Outside of the breeding season these frogs are found in wooded areas, and during the summer months they can be found under loose bark, rotting wood and in hollow trees during the day or particularly dry periods, just as long as these spots can maintain some humidity. They can even be found around human habitation. Many a person has found a gray treefrog on his or her windowsill or porch. Hibernation takes place in leaf litter or around tree roots. Cryoprotectants, chemicals that minimise the damage caused to cells by the formation of ice crystals, such as glycerol, help gray treefrogs survive freezing at temperatures as low as -6 °C for several days at a time (Schmid 1982). They also produce additional glucose as a cryoprotectant (Storey & Storey 1986). They can survive multiple freezing and thawing episodes without any permanent damage. 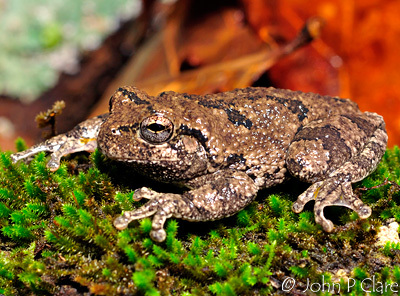 To escape predation the gray treefrog has two main defenses. One is the flash colour present on the inner surfaces of the thighs. The frog's cryptic dorsal markings help it to blend it in with tree bark, but if disturbed, the bright yellow is exposed, ideally startling a potential predator just long enough for the frog to make its escape. The other defense mechanism is the use of noxious skin secretions, which many predators may find unpalatable. Gray treefrog tadpoles from ponds that contain Odonata naiads (Dragonfly and Damselfly nymphs), and predatory beetle larvae, have a tendency to have long, deep and brightly pigmented tails. 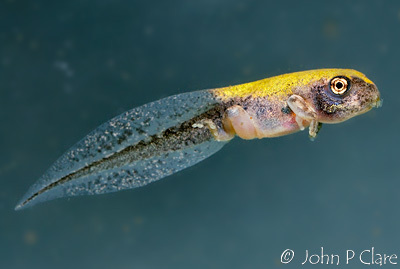 In these tadpoles the tail serves to lure predators away from the more vital body parts of the tadpole. They can afford to loose up to 30% of their tails before swimming performance is affected (Van Buskirk & McCollum 2000). The tadpoles pictured later in this article were captive bred and never exposed to predators, and therefore they don't exhibit the bright tail colouration of their wild counterparts. Gray treefrogs feed upon various insect species. Flying insects such as moths are especially relished. In captivity, crickets, mealworms, and waxworms are readily accepted. Breeding pond of Hyla versicolor, the Eastern Gray Treefrog. 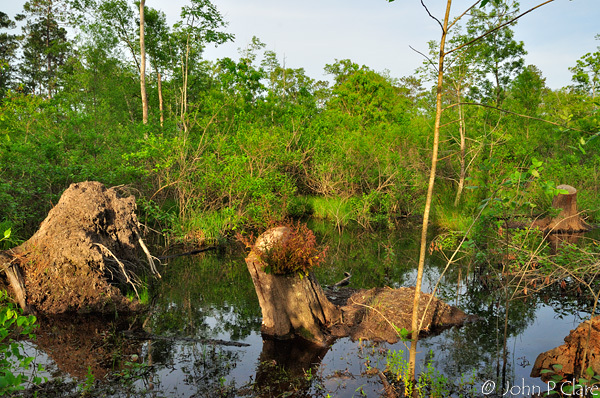 This photo was taken on the 2nd of May 2009 in East Texas, USA. In less than 45 days this pond would be completely dry, but the Gray Treefrogs would be among the first tadpoles to metamorphose. Dip netting the two remaining small puddles on the 13th of June yielded hundreds of tadpoles, including Bronze frogs and Eastern Narrowmouth Toads, but no Gray Treefrog tadpoles. When most people think about keeping treefrogs, they think of a terrarium taller than it is wide, to accommodate branches and plants in which the frogs can climb, hide and hunt for food. That is a good summary of what’s required, though a traditionally shaped terrarium with lots of headspace would be suitable too. Cast a glance at the photo to the right of this paragraph – that breeding pond shows most of the elements to keep in mind when designing your mini treefrog habitat. The two most common types of terrarium enclosure are the glass aquarium with screen lid, and mesh/screen enclosures. Exo Terra and Zoo Med are two companies that manufacture specialised enclosures of both kinds – Exo Terra Glass Terraria; Exo Terra Mesh/Screen Terraria; Zoo Med Glass Terriarum; Zoo Med Mesh/Screen Terrarium. They come in various sizes. The size that suits your frogs’ needs will depend on how many frogs you intend to keep. 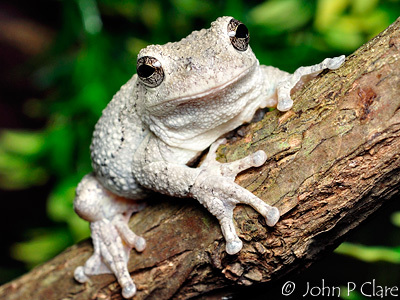 Gray treefrogs are much smaller than White’s Dumpy Treefrog, so smaller terraria can be used. For example, the “small” sized glass Exo Terra terrarium could accommodate 1-2 pairs of grays, though if you are starting with 2 pairs then consider the next size up. The terrarium you choose should be at least large enough to allow the frogs to jump about inside it comfortably. Furnish your terrarium with a good substrate – an inch or two (2.5-5 cm) of additive-free top soil is the best option because top soil contains natural, helpful bacteria which can better stabilise the waste your frogs will produce in between cleanings. Alternatively you can use coconut fibre (sold as bed-a-beast, terrarium soil, and other names). Coconut fibre does not have the balance of natural bacteria that is found in top soil and tends to sour sooner. An alternative is to use a couple of inches of water (~5 cm), with a gentle filter. This latter setup should be cycled like a fish tank to allow the filter to develop a good population of waste processing bacteria. While a water base might seem like a good breeding setup, these frogs lay so many eggs that a small terrarium will not be big enough to accommodate all of those eggs! Whichever substrate you choose, it’s advisable to do spot checks and cleaning of frog faeces and dead food every day. An alternative to, or augmentation of these substrates is the false bottomed terrarium. For more information about these and how to construct one in your terrarium, have a look at our Red-Eyed Leaf Frog article's housing section. Real or artificial plants, or a mixture of both, can be used. Have a look at this thread on our forum for plant species suggestions. Pothos and Wandering Jew are safe and hardy choices which do well in dry and damp conditions with a minimum of light. It’s a good idea to leave plants like these in their pots so that they can be easily removed when it comes to cleaning out the terrarium. Branches, real or fake, should be provided for the frogs to climb and perch upon. Try to avoid narrow branches because the frogs prefer branches at least half an inch wide (1.25 cm) – the wider the better. A variety of perches will help your frogs feel secure. More is always better. In the upper reaches of the terrarium, cover can be provided by the artificial plants sold specifically for this purpose that come with rubber suction pads. Hyla chrysoscelis, Cope's Gray Treefrog. This male was found at over 2000 ft (~700 metres) in the Ouachita Mountains, Arkansas, in November 2008. A water bowl is a good idea to help maintain some humidity in the terrarium. While gray treefrogs are two of the more dry-tolerant species of treefrog available, providing a water bowl gives them the option to soak if it’s too dry. Use dechlorinated tap water or bottled spring water. Avoid distilled or very pure water because the lack of minerals is hard on frog skin if the frog is immersed. Whether you use a water bowl or not, gently mist the terrarium every day using a spray bottle sold for this purpose. Every month or so, clean the terrarium out, wipe down the surfaces, discard the substrate and wipe the branches and perches. Detergent and soap can be harmful to your frogs so if you do use these to clean artificial plants, or the terrarium’s glass, ensure that you thoroughly rinse away these chemicals and residue. Use new substrate every time you make the terrarium up. Many hobbyists have found that keeping frogs in a terrarium without good ventilation can result in sick or dead frogs. With this in mind, a screen lid is important for a glass terrarium. The disadvantage to a screen/mesh terrarium is that it can be a challenge to keep humidity at a frog-comfortable level. A humidity gauge and a thermometer are valuable tools to ensure your frogs’ preferred conditions are maintained. Blocking out a wall or two of the terrarium with black or green paper (on the outside), or one of the commercially available printed backgrounds, will help give the frogs a sense of security and this is particularly important for newly captured/wild caught frogs. Some companies also sell cork or 3D plastic backgrounds for the inside of terraria and these can be quite attractive to you and the frogs! A light on the terrarium is optional but it will benefit your live plants and also make viewing more pleasant. If you do use a light, a fluorescent fixture is recommended. Exo terra setups come with a fluorescent hood, which is helpful. Your choice of light will also depend on whether or not you need to heat the terrarium. Gray Treefrogs tolerate a wide range of temperatures (see the info table at the top of this article) so heating is generally unnecessary. If you must heat the terrarium, it’s recommended that you use an incandescent bulb instead of a fluorescent bulb – this will give light and heat much like the sun, coming naturally from above. Run your light using an electronic timer to mimic a natural day/night cycle. These are available at most supermarkets and hardware shops. Heat mats/heat pads should not be placed under a layer of soil as this arrangement can be a fire hazard – if you use these heat sources it’s advisable to place them on the side of the terrarium. Do not use a heat rock as the heat source because these can get dangerously hot and can burn your frogs. To avoid stress on your frogs, keep your terrarium away from televisions, loud noises and out of reach of other pets. Brightly lit windows can cause dramatic and often fatal temperature changes, so keep your terrarium out of the sun and away from sun-lit windows. Obviously you are free to vary the terrarium as you see fit. 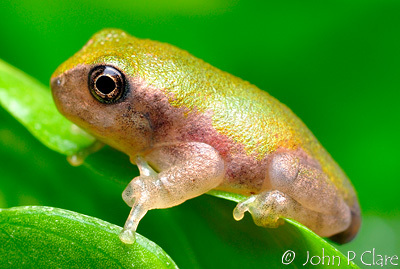 Some people make the mistake of thinking that gray treefrogs come from American swamps. While it's true that these frogs do inhabit forested swampland and bottomland in the American South, they are found throughout temperate forest all the way up into Canada, and not confined to the same kind of habitat and range as the American Green Treefrog, Hyla cinerea. As our friend in the last photo proves, they can be found foraging on cold mountain tops in November. 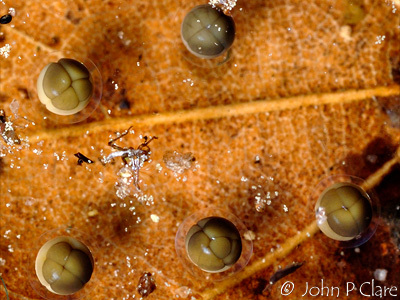 Rafts of freshly-laid eggs of Hyla versicolor, the Eastern Gray Treefrog. Notice how they are generally close to or attached to debris and branches. Gray treefrogs are not fussy eaters. Almost any of the usual amphibian foods will be accepted. We advise that you stick with insects and other types of food that these frogs would commonly encounter in the wild. Recommended foods include crickets, captive cultured cockroaches, mealworms and giant mealworms (not superworms – they are too large), waxworms, locusts, flour beetles and other beetles, phoenix worms, hornworms and smaller silkworms. Some specimens will accept small earthworms. Large females can eat small pinkie mice, but these should be offered only as a very rare treat because amphibians that eat a diet including mice tend to become obese. If you do feed with pinkie mice as occasional treats, it should go without saying that it’s more humane to use non-living pinkies. Feed each frog individually using a forceps/tweezers. This is a preferred method – you get the fun of interacting directly with the frog, it helps the frog become tame, and you also get to see if the frog is eating. Newly captive frogs (those that you have recently caught or have been recently caught by a commercial collector) are usually nervous and reluctant to take food directly from the keeper. Offering a wiggling waxworm or giant mealworm with a tweezers/forceps is a good way of testing their willingness to feed in this way. Patience is the key – within a few weeks they should be quite calm. Put live insect food into the terrarium and let the frogs hunt for it. It can be quite fun to watch a hungry treefrog hunt for its prey. One of the disadvantages to this approach is that the insects may find good hiding spots and never be found by the frog (and in the case of crickets, die and start to rot where they have hidden). So it’s a good idea to check that all of the food has been eaten and if it has not, dispose of it. It helps to feed only a few insects at a time so you and the frogs can keep track of them. Another disadvantage of this method is that uneaten crickets and roaches can take a nip the frogs, and this can break the skin and cause damage. It can also cause stress to the frogs and this can lead to disease. Put the frog(s) and some prey in a large margarine tub or a non-see-through tupperware container with a lid and leave them there for an hour or so. This is one of the least stressful methods of getting a new, nervous captive to eat successfully until the frog becomes used to humans. Variety is the key to any good diet but it doesn’t hurt to dust food items occasionally (once every few feedings) with a vitamin and mineral supplement sold for amphibians and reptiles. An occasional dusting with a calcium supplement is also advised. Don’t mix the calcium supplement with the other supplement because the calcium can cause some components of the other supplement to degrade and it can also inhibit uptake of some nutrients. Supplementing will help your frogs grow and ensure their nutritional demands are met, thus optimising their health. Froglets - tadpoles that have recently turned into frogs and lost their tails – do well on a diet of cultured fruit flies and pinhead or small crickets. It’s a good idea to dust these food items occasionally with the same vitamin/mineral supplements mentioned earlier. Froglets should be fed daily as much as they will eat. Leaving a bunch of fruit flies crawling around with them does no harm and means food is available on a constant basis. If you use fruit flies, please culture your own or purchase a culture – don’t attempt to attract wild ones because, aside from the fact that it can be messy, the wild ones can fly! A note on crickets: whether you are feeding frogs or froglets with appropriately sized crickets, it’s a good idea to “gutload” the crickets prior to offering them to the frogs. Think of the crickets as an empty container – not a lot of nutritional value, but capable of carrying a lot more if they are fed with a good food for a day or two prior to being fed to your frogs. Many pet shops sell cricket keepers – a small plastic tank with a screen lid, hideaways for the circkets (which double as an easy way to collect and feed the crickets to the frogs) and two little containers for food and water (put food in one and water in the other). One of the best foods to offer crickets for gutloading is flaked fish food. Gray treefrogs are not difficult to breed, but they almost always require cycling in order to do so. Cycling means that you subject the frogs to a distinct cool period and then let them experience a warmer period afterwards – you are simulating winter and then spring/summer. Thank you to Vincent over at Caudata.org for his input into this section. Cycling: To cycle these frogs, a cool period of at least 3 months is required. Feed the frogs regularly right into mid-Autumn (~mid October, assuming you are in the Northern Hemisphere) and then cease feeding and leave them alone. In 1-2 weeks they should have cleared their guts of food. Do not feed them again until they have completed the entire cycle. Prepare a large tupperware/plastic lunchbox with good ventilation (for example, drill many holes in the top). Fill the container 2/3 of the way with top soil and/or peat - coconut fibre is not advised for this purpose simply because it is not a stable, balanced substrate that can be left unchanged safely for months at a time. Add some real moss (dried or alive) as cover. You can add pieces of bark as extra cover. Place the frogs in the container and make sure it is sealed and escape proof. Over the cooling period make sure that the substrate does not dry out completely by very gently misting every week or as necessary – try not to disturb the frogs. At this point, which should be about the beginning of November if we started in mid-October, they can be placed somewhere to cool gradually, such as a covered outhouse or garage, depending on your climate. Try not to subject them to sudden temperature changes at this point and absolutely do not feed them. As mentioned earlier in this article, these frogs can survive several periods of -6 °C (21 °F) - this means freezing solid - but try not to subject them to such severe conditions. After 3 months in these conditions take the container into a warmer place and try to let it warm up gradually to “spring”. Within a week or so you can transfer them to their normal terrarium and normal temperatures. It is at this point that you should begin feeding again and feed them very well. It should be noted that if you live in a country that does not undergo a real winter period then you will need to simulate the cooling period using a devoted fridge or cool room, set to the appropriate temperature. Hyla versicolor, Eastern Gray Treefrog. 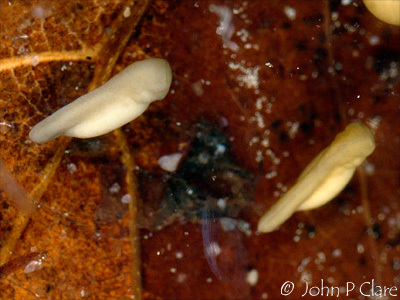 Top-left: 5 hour old eggs/embryos showing early mitosis - you can actually see the top embryo is in the process of dividing again; Top-right: 24 hour old embryos in tailbud stage - they will hatch in less than 36 hours; Middle-left: Tadpole showing hind-leg buds; Middle-right: Tadpole with almost fully developed hind legs and partially developed front legs (under skin); Bottom-left: Tadpole with all 4 legs and tail starting to resorb; Bottom-right: Newly metamorphosed froglet (36 days from laying) showing dark tail nubbin. After a period of about 2 months eating again, we can now attempt to breed the frogs. At this point it is helpful to have the terrarium temperature at about 20 °C (68 °F) or slightly higher. Your males should begin to call at around this temperature. I have found that a pronounced increase in humidity and temperature at this point can induce amplexus and laying. I have had repeated success by simulating these conditions. I pick a male who has been calling recently, along with an adult female kept under the same conditions, and early in an evening (about 6pm) I put them in a small, non-see-through margarine tub with a spray from a misting bottle, then I put the lid on (no holes) and I place the tub in a dim or dark but distinctly warmer environment than the vivarium (an increase of about 5 °C (about 12 °F) warmer). I check the tub at about midnight. If the pair is not in amplexus, they are returned to their vivarium and the process repeated in a few days. If the pair is in amplexus and remains so when disturbed, place them in a container like a ~60 cm diameter rubbish bin/trash can (that’s about 2 ft. diameter), with plenty of emergent branches and about 10 cm (4 inches) of dechlorinated water. Set this up in a place that will receive morning light, though not direct sunlight. Cover the top with a sheet of glass (don’t worry, it won’t be air tight). Make sure they are not disturbed until no sooner than the following afternoon. Eggs are usually laid around sunrise or a few hours afterwards. Laying should be complete by midday – the pair will separate when they are finished. Return the parents to their vivarium. Now comes the hard work! Raising eggs, tadpoles and then froglets: Firstly, an adult female can lay over 2000 eggs. It might sound like you will have your own private army of frogs but it’s at this point that you need to make some tough decisions. Raising all of these offspring will be immensely demanding on your time and resources, and for most people this is not practical. Trying to raise several hundred will certainly result in deaths along the way. I strongly urge you at this point to either give away all but a maximum of about 100 eggs, or if giving them away is not an option then cull them (i.e. kill all but 100 eggs). The latter option might sound cruel but wouldn’t you rather be sure to raise a smaller group of very healthy froglets than a larger group of sickly, slow growing frogs, and lose a lot to unnecessary deaths along the way? Keep in mind that less than 4% of these eggs would make it to froglets in the wild. Gray treefrog eggs are very sticky indeed and remain so until close to hatching. They are difficult to manipulate so keep this in mind when you are planning your breeding efforts. At 23 °C (73 °F) the eggs should hatch in about 3 days. After hatching, the tadpoles will swim to a nearby object or the base of the container and hang there. The tadpoles do not become free swimming and they do not eat until they have absorbed all of the yolk in their bellies (the creamy white area on the underside of each tadpole at this stage), and this can take as long as 6 days for these species at this temperature. When the tadpoles begin to swim actively and no more yolk is visible, the head shape should be more bulbous and the body more “tadpole”-like. Feed tadpoles on a good tropical fish food. I use granular Tetra tropical fish food (it’s a red colour and tends to sink), but any brand will do. Tadpoles will learn to eat at the surface if food is only placed there (such as flake food) but they are more likely to swallow air and develop gas bubble problems. Tadpoles suffering from this are usually quite obvious – they have difficulty diving and tend to float. In severe cases the belly becomes distended and a very obvious air bubble is visible. This problem is commonly encountered when the water is warm and isn’t being renewed frequently enough. Most tadpoles will recover if removed to a container of shallow water and left undisturbed. Provide some floating food so that they can eat this while floating and this can help purge the gut of gas. Not all tadpoles can recover from this problem so try to avoid it by feeding sinking food and keeping the water fresh. One raising approach that I have used very successfully is to raise about 50 tadpoles in 5 US gallons (20 litres) of dechlorinated tap water, with a near complete water change every 48 hours using dechlorinated water of a similar temperature (within a degree Celsius or so, to prevent shock). At 23-25 °C (~73-76 °F) feed the tadpoles as much as they will finish eating in about 5 hours, which means you can feed them several times in 24 hours. It’s better to underfeed a little than to overfeed and increase the rate that the water will foul. Following this regimen, after about 15 days hind leg buds should be quite visible. Hind legs should be fully developed in many tadpoles by the end of the 4th week. 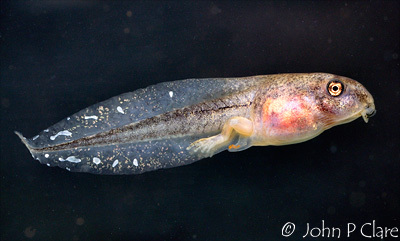 Front legs develop under the skin as the hind legs reach their full size, and during the 5th week the front legs should begin to pop out on the more advanced tadpoles. Around this time you should notice that the dorsum (their backs) become greenish-yellow in colour – a sure sign of impending metamorphosis. Tadpoles will feed as normal until the left leg pops through the spiracle (the last leg to appear). 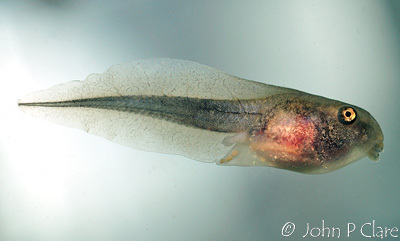 The spiracle is the tube on the left of the body through which water is expelled from the tadpole's breathing process – these tadpoles have internal gills. As the front legs emerge, the tail is already resorbing (yes that’s the correct term). Feeding ceases until the tail is completely gone. When a tadpole has all 4 legs, transfer it to a container of very shallow water, put the container on a slope so as to have a small water area and a land area onto which the froglets can easily climb. If left in deeper water froglets drown very easily as the tail is resorbing, and despite their ability to climb out of the water using their toe discs, not all will do so before drowning. Sibling froglets of Hyla versicolor, the Eastern Gray Treefrog, showing variation in patternation and colouration. These froglets are about 10 days past complete tail resorption and were captive bred. Note how the under-eye markings are all slightly different - useful for telling individuals apart. Your first froglets should have metamorphosed by the middle of the 6th week and the last stragglers should reach metamorphosis between the 9th and 12th weeks. Transfer young froglets to a well ventilated vivarium. Top soil or coconut fibre (the latter is better for temporary cages because it is usually less messy to clean out) can be used as a thin layer of substrate and include some real potted plants, such as Pothos - I leave mine in their pots to make cleaning easier. The froglets will hang out in the plant leaves. Feed your froglets daily with fruit flies (culture your own wingless or flightless fruit flies). Dust every 2-3 feedings with vitamin and mineral powder mixed with calcium powder (mix as used, do not store mixed). Alternatively, use gut-loaded pinhead or very small crickets. To gutload the crickets, feed them on flaked fish food for a few hours prior to giving to the frogs. The perfect diet is a varied one, so feeding froglets with pinheads and fruit flies is advised. Froglets should show marked size increases within 3 weeks. If raised on a good diet and fed regularly these frogs can reach breeding size within a year! Completely break down the froglet vivarium every few weeks to prevent soiling - sooner is better if you have a lot of froglets. I can’t over-emphasise not trying not to raise too many tadpoles or froglets at one time - it's better to raise a smaller number very well than many more badly, losing many along the way. Hyla versicolor, Eastern Gray Treefrog. Calling male photographed in a tree in the middle of an ephemeral pond. Note the warning colours at the base of the hind leg. Gray treefrogs are perhaps the most under-appreciated treefrog in North America. They are found over much of the United States and largely go ignored as pets. While this might help their conservation (which is a good thing), they make rewarding captives that tame well, with each frog possessing its own personality. 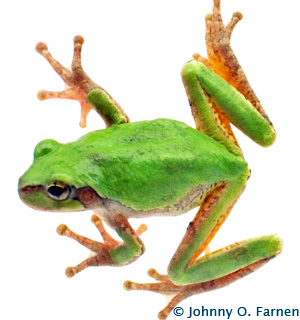 This species has been in great demand with European treefrog enthusiasts for many years. If you like treefrogs and want a hardy, undemanding pet that breeds relatively easily and doesn't demand much space, then Grays should be high on your list. They are hardier than American Green Treefrogs (Hyla cinerea), much more manageable in size than White's Dumpy Treefrog (Litoria caerulea), and almost certainly the most chameleon-like of all treefrogs available as pets. If you do choose to acquire this species please look for captive bred individuals first. If you can't find any and you live in North America, consider collecting 1-2 yourself (if it is legal in your state). In other parts of the world, this is obviously not an option. Not purchasing wild caught animals helps to discourage commercial collectors and you will have a frog that will suffer less stress than one that has been through a wholesaler. Also, if you collect it in the right part of the US or get to hear it calling, you can be more sure of the species. Please only resort to commercial dealers of wild caught animals if you have exhausted all other options or you live outside North America. Since most gray treefrogs are wild caught in origin, they should be taken to a vet for treatment for internal parasites. He/she can administer a regimen of metronidazole (flagyl) at 50 mg per kg of frog given 3 times at 4 days apart, and a single dose of fenbendazole (panacur) at the same dosage level in between the first and second dose of metronidazole. This will ensure your frogs get the best start in captivity, parasite-free. Commercial dealers do not treat their frogs for parasites. Now, if you'll excuse me, I have to give some more fruitflies to my horde of froglets! 1. Conant, Roger & Collins, Joseph T. A Field Guide to Reptiles & Amphibians - Eastern and Central North America (Peterson Field Guide Series) 1998; Houghton Mifflin Co.
5. DeGraaf, Richard M. & Rudis, Deborah D. Amphibians and Reptiles of New England 1983; University of Massachusetts Press. 6. Ralin, Dennis B. Ecological and Reproductive Differentiation in the Cryptic Species of the Hyla versicolor Complex (Hylidae). The Southwestern Naturalist 1968, 13(3), 283-299. 7. Schmid, W.D. Survival of frogs in low temperature. Science 1982, 215, 697–698. 8. Storey, K.B. & Storey, J.M. Freeze tolerance and intolerance as strategies of winter survival in terrestrially-hibernating amphibians. Comparative Biochemistry and Physiology A 1986, 83, 613–617. 9. Van Buskirk, J. & McCollum, S. A. Influence of tail shape on tadpole swimming performance. Journal of Experimental Biology 2000, 203, 2149–2158. Thankyou so much for the information. They look just like your picture of the gray tree frog. I need to go to petco and get some crickets. Right now they are in an enclosed plastic container with grass, leaves and water. I sprinkled some fish food into the container. They like live food. They need small crickets. You can feed the crickets fish food,and gut load them so the nutrients go into the frog once the eaten the crickets. What more could I ask for,,,,,,thanks for an extreemly informative article.,.. Great article! Does anyone know of any breeders? I'm very interested in these guys. Good info my female grey tree frog of almost 8 years of age named lichen is summaler to this she often licks my fingers. I just put a male in is it bad to have a male for a few days? I want to watch the behavior of the male. First of all he is very Loud so I put the tererium on my pourch. They started to mate and I haven't gone through the cooling sycle. Will they have Babies? LOVE this site. Thank you so much. i have 10 grey tree frog frog-lets and might keep a few, how many do you recommend keeping in a 30-40 gallon tank? Very very helpful. I have a male and female along with a male Green tree. I am currently in set up because I recently bought the Green and needed to find the right care for each. My two grey though I raised since tads. The male is skinny and I need to figure how to make him right before he dies. I have some tadpoles (soon-to-be froglets. 2 of them have all 4 legs.) in an aquarium right now that I caught out of the swimming pool. I have an 18" x 36" x 36" on order. How many do you think I could keep through to adulthood in the terrarium? Update: I now have one that has resorbed its tail (little bugger did so overnight. I didn't know it happened that fast) and climbed out of the water, and 2 others who are climbing out but still have most of their tails. I couldn't believe how fast that happened too! One day I checked on my tadpole and he only had the back legs. The very next day he had two fully grown front legs! I have one gray tree frog and would like to get another as a friend for mine. He is in the terrarium with 3 other frogs. where are you located or how would I be able to get one? thanks. I have a gray tree frog. I believe he is a male. I wanted to know if he should go through the cycling even if I don't plan on him breeding? Thanks. Now I don't feel so bad as mine did the same thing practically over night. LOVE this article. The "grays" have definitely pulled at my heart strings. They have the cutest faces and the most awesome patterns. I can't wait until my froglets get full grown!